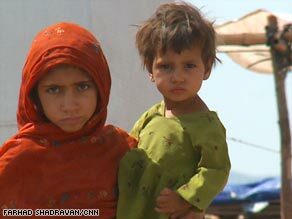 JALOZAI REFUGEE CAMP, Pakistan (CNN) -- It's an exodus on an almost biblical scale. And it has produced a mosaic of plastic and canvas that is now home to more than 93,000 people -- with more arriving each day. These children are among the thousands of refugees this month at the Jalozai camp in western Pakistan. This is Jalozai refugee camp near Peshawar, suddenly almost a city in its own right as thousands flee the violence raging between the Pakistani army and Taliban fighters. The United Nations estimates that it's the biggest movement of people in Pakistan since the country was formed in 1947. Officials say up to 1.8 million people have been forced from their homes. Food is available at this camp -- fruit traders work their way through the avenues of tents. But people here can't afford to buy much. They make bread with flour handed out by the United Nations, but they say it's not enough. "It's very difficult, there's lots of jostling," says Mehboob Shah, a man at the camp. When there is food, he says, "it's very poor quality -- even the cows won't eat it." There are eight field hospitals in this camp. On a recent morning, 380 new patients registered for treatment -- most of them women and children, suffering from diarrhea and heat stroke. Some have signs of mental trauma. "They are complaining of fear, phobias, palpitations and all symptoms seem to have started since they arrive in this camp," said Abid Farooqi, with the Pakistan Institute of Medical Sciences. Pakistani Interior Minister Rehman Malik underlined the seriousness of the situation. "I feel that this is even worse than the earthquake in Kashmir," he said, referring to the 2005 disaster. He noted that most of the people are from an area with relatively cold weather, and are unprepared for the heat here. Officials, he said, "are making all possible arrangements" to help. Water tankers provide a lifeline in the stifling heat. And on the edge of the camp, workers are clearing the ground for more tents. There is no sign of this influx ending any time soon.